Alyson Schafer is a psychotherapist and one of Canada's leading parenting experts. 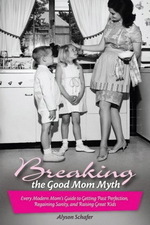 She's the author of the best-selling "Breaking the Good Mom Myth" (Wiley, 2006) and host of TV's The Parenting Show a live call-in show in Toronto, Ontario. The media relies on Alyson's comments and opinions. you can find her interviewed and quoted extensively in such publications as Cosmopolitan, Readers' Digest, Canadian Living, Today's Parents, and Canadian Families. We all know kids don't come with an instruction manual, but Rogers TV brings you the next best thing. Join psychotherapist and parenting expert Alyson Schafer and her co-host Jennifer Anderson for The Parenting Show. Call in and learn the tricks of democratic parenting. Learn to give your child both independence and responsibility while using discipline to teach and guide. Use Alyson's advice to train your kids to take a problem solving approach to life and to view mistakes as opportunities to learn. Encouragement is the mainstay of parenting and viewers are invited to dial in to get expert advice and best of all, learn from other parents that your challenges aren't unique!